1. Private Pilot Manual: The manual is arranged in chapters so each lesson is taught in an organized fashion. The student should read the appropriate lesson before and after each class, paying particular attention to the insets and summary checklists. 3. FAA Airmen Knowledge Study Guide: The student should review the FAA written test questions & answers for the Chapter and section just completed. 4. Knowledge Test Question Bank and Supplement: This is a duplication of all the possible questions that are on the FAA’s written exam. 5.. Private Pilot Stage Exams: The instructor will have each student complete the appropriate written exam at the end each stage (after lessons 6, 10 and 15). 6. Final Exams: The instructor will have each student complete a final exam which is separated into parts a and b. 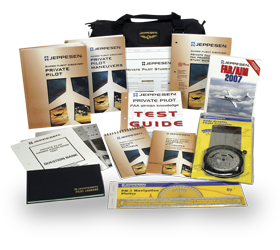 After a thorough review, the actual FAA airmen knowledge test should be completed without delay,. 7 FAR/AIM: This text references ground lesson 8 which is Federal Aviation Regulations. The text also includes the complete Aeronautical Information Manual and Pilot/ Controller glossary. 8. Flight Training Syllabus: This provides a lay out of the flight training in three segments. Each stage builds on previous flight lesson. 9. Private Pilot Maneuvers: This is a step by step description to help understand each flight maneuver that will be performed in the airplane. 10. Practical Test Study Guide: This explains how to prepare for the Practical Test (the actual FAA oral and flight tests). It contains the required flight maneuvers, explanations, and sample oral questions with answers. 11. Presolo Written Exam: This is a home test that must be completed before a solo flight can be completed. 12. Student Record: This is used in the office to keep a record of all the completed maneuvers from the syllabus. 13. Flight Computer with Manual & Plotter: This will be used in the ground school as well as in the cross country phase of the flight training. 14. Pilot Logbook: This is a log that each pilot possess to keep track of all accumulated hours and lessons. Video Presentations provide an excellent overview for each lesson. The appropriate video is referenced in the syllabus for each ground lesson (starting with Lesson 2). A set of DVD's is available for home viewing. or Click here to register now!